Tonia Moore, Chief Vascular Technician at Salford Royal talking all about Raynaud's. My fingers only go blue – do I have Raynaud's? Usually on examination or close questioning there tends to be more colour changes that have possibly gone un-noticed so I would tend to say that the answer is probably YES and thermography can confirm this. Does Raynaud's run in families? There is no direct genetic link that we know of but a tenancy to coldness runs in families and Primary Raynaud's Phenomenon is a very common condition. Can Raynaud's cause nerve damage? There is a temporary loss of sensation associated with Raynaud's that is associated with temporary impairment of the nerves whilst the fingers are cold. Occasionally it may be something more than this and if the fingers are permanently numb then nerve conduction studies might be recommended. I have Raynaud's and find I can still have colour changes even though take precautions to keep my hands warm. I don't want to take medication but am I doing more harm than good in resisting? Keeping the hands warm is sensible. Although you are probably not causing damage to the blood vessels by resisting treatment, if you develop ulcers or other complications it would be wise to consider taking treatments to open up the blood vessels and improve circulation. If you are reluctant to take medication you may consider supplements such as fish oil, gingko biloba or vitamin E.
I have Raynaud's in my feet and am due to go on holiday- do you have any advice about flying? Long haul, for more than 4 hours has been associated with clots in the legs. You should try to keep flexing your ankles and moving as much as is possible during the flight. Flight socks may be useful. There is not a specific problem with the Raynaud's other than the plane's air conditioning which can be quite chilly. Can Raynaud's cause ridges on the toenails? There is no specific association between Raynaud's and ridges but sever symptoms can make the nails grow poorly due to the limited blood supply and this can increase the number of nail infections. I find using a wax bath a real comfort and enjoy using it and I feel it improves flexibility but is there any medical evidence that it can reduce the frequency or severity of future Raynaud's attacks? Following a recent study using wax baths it was found that they didn't alter the frequency or severity of attacks which we felt was disappointing as patients reported that they did feel that the use of the wax bath was comforting. I would like to ask if keeping Raynaud's at bay helps to prevent the dreaded finger ulcers or is that a separate condition which may or may nor occur in Scleroderma. 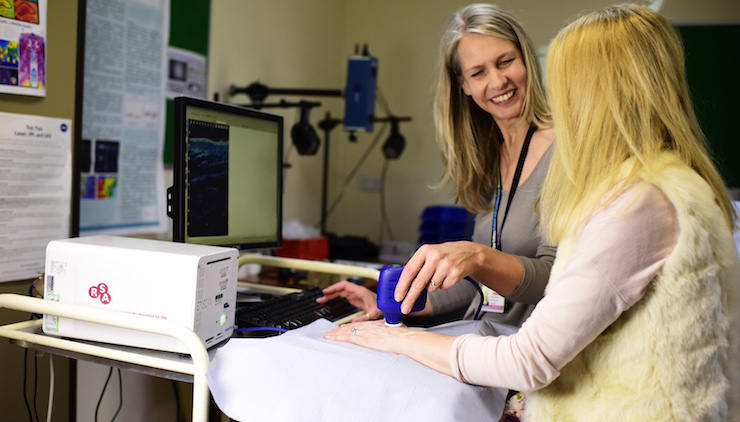 Keeping Raynaud's at bay is obviously beneficial in making the Raynaud's symptoms easier to manage. We think that finger ulcers occur as a result of problems with the vasculature so it is difficult to anticipate whether or not they may occur. Lifestyle changes such as giving up smoking would obviously be hugely beneficial to those who smoke. My question is regarding the use of impact tooling. I've recently been diagnosed by two doctors with Raynaud's which my employer originally thought could be HAVS. I use impact tooling at work and am concerned I could be making the Raynaud's worse through the vibration. My symptoms have definitely got worse. Does you think vibration exacerbates the Raynaud's? Vibration tools will exacerbate the symptoms of Raynaud's. It is important to follow the advice of the Doctor, to use personal protective equipment to reduce the impact of the vibration and to limit the amount of use to the recommended time. A friend in South Africa has a 12 year old with Raynaud's and they are struggling to find information. Can you advise whom they could contact. I've Raynaud's and Scleroderma living in the UK. I'm not sure of the medical arrangements in South Africa. If it is difficult to get advice about managing the symptoms from the local Doctor and if there is access to the internet then please have a look at for specialists in the UK as they may be able to provide further information. My arms have started throbbing at night and are really painful. The pain wakes me up early in the morning and I can't get back to sleep. I have secondary Raynaud's (for three years) and lupus and take Hydrochloroquine. What can I do or take to help the pain? It is important to find out what is causing the pain your Doctor will be able to advise on the best treatment. I have Scleroderma and Raynaud's and I have recently been told by another Scleroderma sufferer that when you have a Raynaud's attack in your hands or feet that the same thing is happening to your internal organs, is this correct? Is the blood flow also being restricted to your internal organs? Would love to have an expert's opinion. 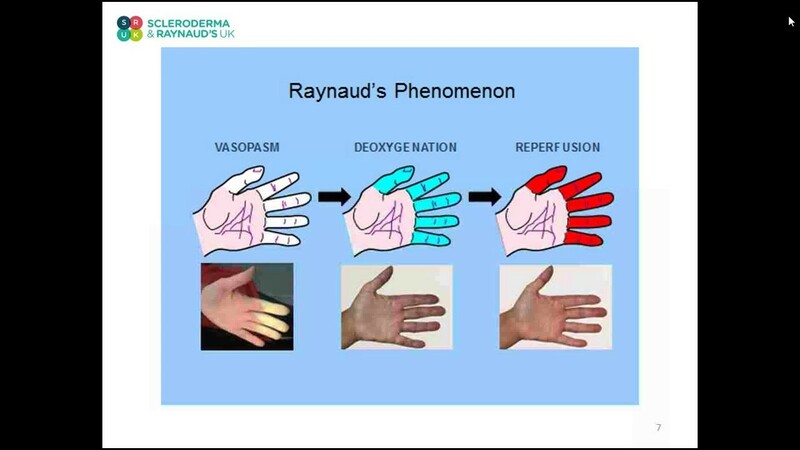 There is some thought that this is the case but Raynaud's is predominantly a peripheral vascular problem and it is in the extremities that the effects are experienced the most. I have c.r.e.s.t and my Raynaud's has caused feet problems one of which is ingrown toenails in both big toes. I also have no spleen. I go every 5 weeks to the podiatry clinic to have these being treated which is very painful. This has been going on for about a year, the podiatrist wants me to go to the podiatry consultant to have treatment. My rheumatologist says it would but too risky due to possible infection. I don't know what to do. When you have specific complications then it is best to follow the advice of your Doctor who is aware of all the different aspects of your condition. Your GP will be able to refer you to the nearest specialist. You can also find useful information in the specialists index as they may be able to provide you with more information. With Raynaud's symptoms, some people have uncomfortable numbness and pain on warming. I find I have excruciating pain in cold before the blood has drained. My hands go grey/blue often before white and that's when they're most painful! Like someone is squeezing pliers on my fingers. Is it the vascular spasm? Many Raynaud's sufferers I know (not necessarily Scleroderma though) don't get this initial pain. Is there a difference between the mechanism of Sclero Raynaud's and primary Raynaud's that makes the pain different? I'm having a provisional scleroderma diagnosis and a keen climber/cyclist/work in cycling so it massively affects life. The symptoms of Raynaud's can be excruciating and it may be that in climbing and cycling the symptoms you feel in your hands are more pronounced. It is hard to say whether this might be a different mechanism between a primary and secondary condition. It is worth being extra vigilant in keeping the fingers warm, using hand warmers and gloves, reducing exposure to the cold and asking your Doctor whether there is any treatment that might alleviate your symptoms. I am not sure how to phrase this, I would like to know if it can affect other parts of your body, I get an extremely cold lower part of my face, even though wrapped up. I also seem to be able to sleep for hours after an attack. My concerns are being dismissed. But last night going out for a demo I got extremely hot, I wonder around in leggings and a cotton shirt. I find it hard at times to tell the temperature, I wanted to go and lie in a bucket of ice, I walked home dragging my feet slightly and then fell down trying to open my front door, was confused, it was mild out, I usually have a few layers on. I don't know how to deal with getting extremely hot. I used my fingers tips to bring down my core body temperature. Raynaud's can affect the extremities and the effects may be extreme from the initial cold phase to the later hot phase. The symptoms of Raynaud's may be different in different individuals. Layers of clothing will enable you to manage the body temperature so the core doesn't become too cold or too hot.